I finished reading another book. 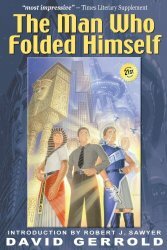 This one was The Man Who Folded Himself by David Gerrold. But I finished The Man Who Folded Himself several days ago and I really liked it. I’m afraid at my current pace of finishing, I’m going to fall terribly short of my 60 book goal. So—on to the next!